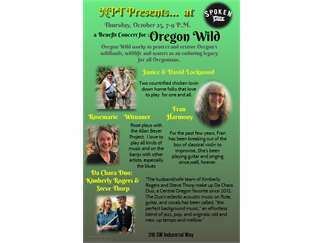 Please join us Thursday October 25th from 7-9pm at Spoken Moto in support of local nonprofit Oregon Wild. 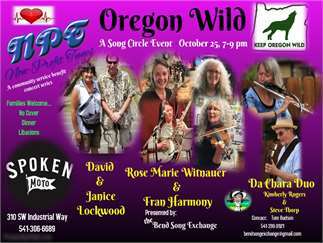 David and Janice Lockwood, Rosemarie Witnauer & Fran Harmony, and the Da Chara Duo of Kimberly Rogers & Steve Thorp will perform song in the round that will hear guitar, banjo, ukulele, fiddle and flute fill the room with lively renditions of originals and covers. Families welcome. No Cover.